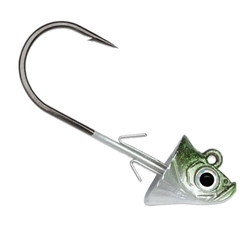 The VMC Swimbait Jighead ad the final touch to the illusion of a live minnow. Designed to mimic a baitfish head, they feature flared gills, 3D holographic eyes and a concave head that allows your swimbait to nest up tight to the jig. Equipped with a forged shank, hi-carbon steel, 1X strong hook and a double wire keeper to ensure your bait stays on. The VMC Swimbait Head has a flared head that perfectly fits any soft plastic swimbait.